MRM and Gerald Fierst share "Pig and Bear Big Business" in Kuala Lumpur. Techniques for telling with another. Use of this technique for teaching storytelling. Sources for tandem telling. Taught with Jen and Nat Whitman (The Whitman Story Sampler). 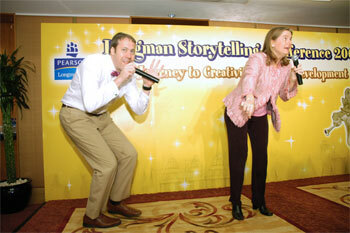 Jen and Nat Whitman (The Whitman Story Sampler) share "Pickin' Peas" in Hong Kong.